MOSCOW, October 27. /TASS/. The latest report of the OPCW-UN Joint Investigative Mechanism (JIM) probing into reported uses of chemical agents in Syria totally ignores conclusions made by Russian specialists, the Russian foreign ministry said on Friday. 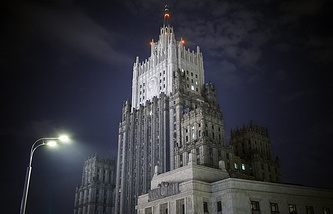 According to the ministry, Moscow has begun a thorough analysis of the report. "However it is evident after looking through the report that the conclusions and opinions of Russian specialists that were referred to JIM at its own request have been totally ignored. Moreover, it gives no answers to our questions either," the ministry said. Instead, "the report has diametrically opposite conclusions derived by some anonymous research centers and ‘independent experts,’ which lack convincing proof to be backed." "We will provide a more detailed analysis after a thorough study of the report next week. Concurrently, as has already been said in the Russian foreign ministry’s statements of October 24 and 25, we will draft and refer to the United Nations Security Council a plan of further steps concerning the expiration of the JIM’s current mandate on November 16," the ministry said. On Thursday, the Joint Investigative Mechanism of the Organization for the Prohibition of Chemical Weapons (OPCW) and the United Nations presented a new report placing responsibility for the April 4, 2017 chemical attack in Khan Shaykhun on the Syrian authorities and for the use of sulfuric yperite in Maarat Umm Hawsh on September 16, 2016 on Islamic State (a terrorist organization outlawed in Russia) militants.